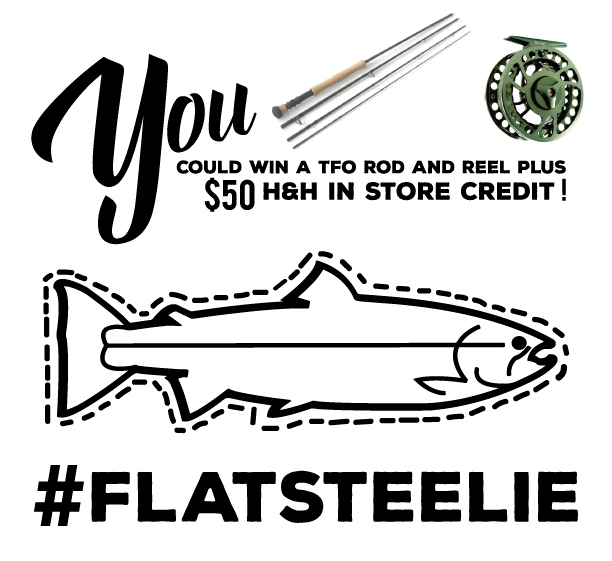 The peeps at H&H Outfitters are always keeping things fun and off beat and their latest contest centers around #FLATSTEELIE and it's easy to play. All orders that include a STLHD item will receive a #FLATSTEELIE and an opportunity to win some stellar gear. "Here’s the deal. From now until Dec 11th every order that includes a STLHD garment will get a Flat Steelie and you could win some seriously rad stuff! All you gotta do is cut out Flat Steelie and take him with you. Anywhere really, fishing of course but, you could take him hiking, cycling, camping, hunting it doesn’t matter. Take a photo with Flat Steelie and hashtag “flatsteelie”. On December 20th we will choose three winners. The crazier the photo the better! Prizes are listed below. Extra points given for coloring Flat Steelie or dressing him up. Good luck and don’t forget to hashtag! 1st Prize = A Temple Fork Outfitters NXT 8wt rod and BVK reel! Plus $50 instore credit with H&H! 2nd Prize = $50 instore credit with H&H! 3rd Prize = Free H&H hat and Tee of your choice!" Visit the H&H Outfitters website and remember to use "TFMRAD" for 10% off your order. Good luck and let's have some #FLATSTEELIE fun.